This class is for you without any experience or very little of Ashtanga Yoga, or for you who have done a weekend workshop. You are introduced to the basics of Asthanga Yoga. You will learn breathing (Ujjaji), bodylocks (Bandhas), Sun Salutation A+B (Suryanamaskara). We also go through the standing sequence thourougly and some of the finising positions (asanas) in a very slow speed. Further on in the course focus is put in syncronising breath and movement and you will through that find a flow (vinyasa) in the serie. Then you will also learn gaze points (dhristi), some sitting asanas and a few more finishing asanas. The focus here is on memorizing the asanas and to syncronise breath and movement - vinyasa. Here you train by your self in your own rythm, with assistance of the teacher in asanas. (some class is without assistance of teacher, se schedule). You practise at your own level and the teacher will guide you and give you new asanas when you are ready. In Mysore you know the order of asanas or follow a paper with the order by yourself. Yoga Calm is a careful and soft introduction or a alternative to AsthangaYoga. We focus on a relaxed breath and your body can slowly adapt to asanas. Yoga Calm is a good yogaform if you have not trained for a long time, or need to/want to take it easy for any other reasons. We start with a simple pranayam (breathing). The class focus on different themes such as one class where shoulders, hips or back is worked on. We explore how you use your shoulders f.ex. in the asana, how you can build muscles around them to prevent damages or injuries. We finish the class with restorative positions on pillows and/or yoga nidra - that is a guided deep relaxation. This class is for you who need to develop your body awerness and want to calm and relax yourself within. Drop In is ok and Term or punch ticket is valid. *To be able to mentally calm down and tune in on your yoga it is fortunate if you can come 10 minutes before your class start. *Please eat no big meal within 2 hours before a yoga class, do not drink 20 min before and also wait 30 min after to eat or drink. *You will need comfortable clothes - shoes are not used, we are barefoot. There are mats to borrow, echological of course, and some latex free if you are allergic. But you can also buy your own mat if you want. *To prevent injury please take off jewelery/bracelets etc if you can, and please avoid perfume as we swet a lot. *Please be clean and where clean clothes both for yourself and your yoga classmates. *Listen to your self as noone knows you better than you! Stretches may be felt but should never hurt. Last but not least, do not compare your self with others. Yoga is not a competetion på strive for development on a higher level. The most important is to have fun! Life is hard enough anyway and the last we need is more demands. Best of luck and above all - have a good time! För dig utan erfarenhet av Ashtanga yoga eller som har gått en helgkurs. 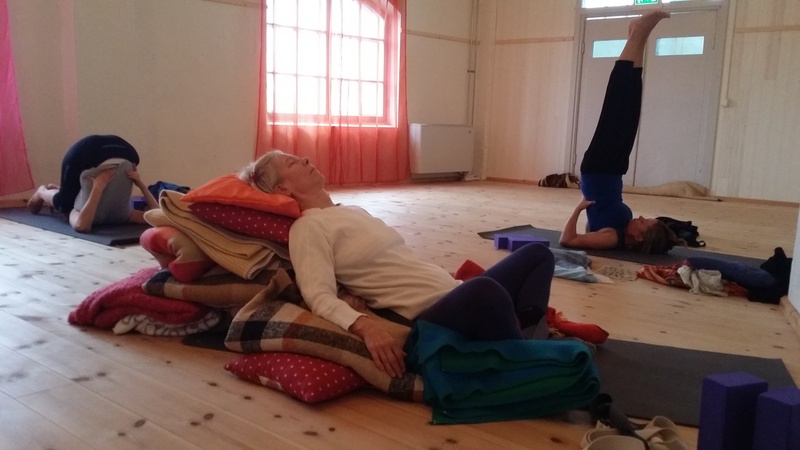 Du introduceras till grunderna i Ashtanga yoga. övningar i ett väldigt lugnt tempo. Senare inom kursen lägga vi fokus på att koppla ihop andning med rörelse och får därigenom ett flöde (vinyasa) genom ställningar. Dessutom lär du dig nu fokuseringpunkter (dhristi), några sittande ställningar och fler avslutande ställningar.